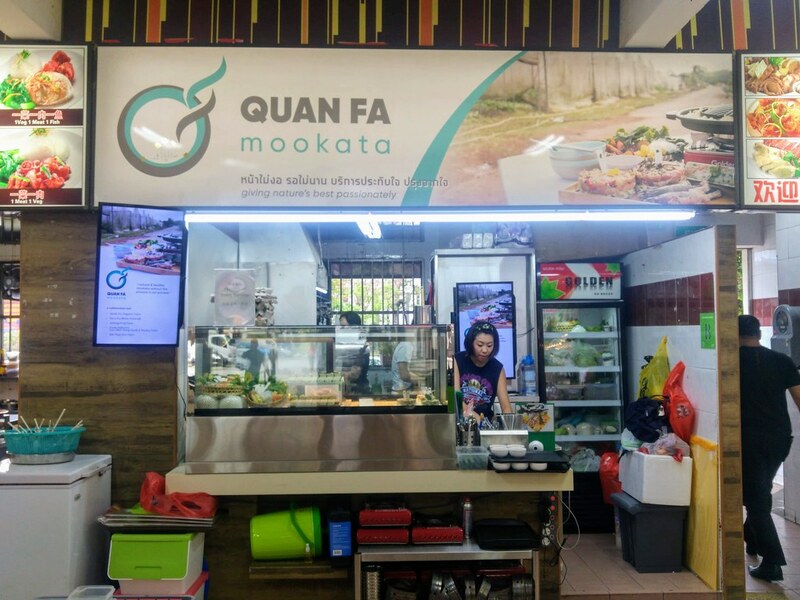 Mookata made healthy by Quan Fa Organic - right at Quan Fa Mookata located deep inside a neighborhood coffee shop at Jurong East. 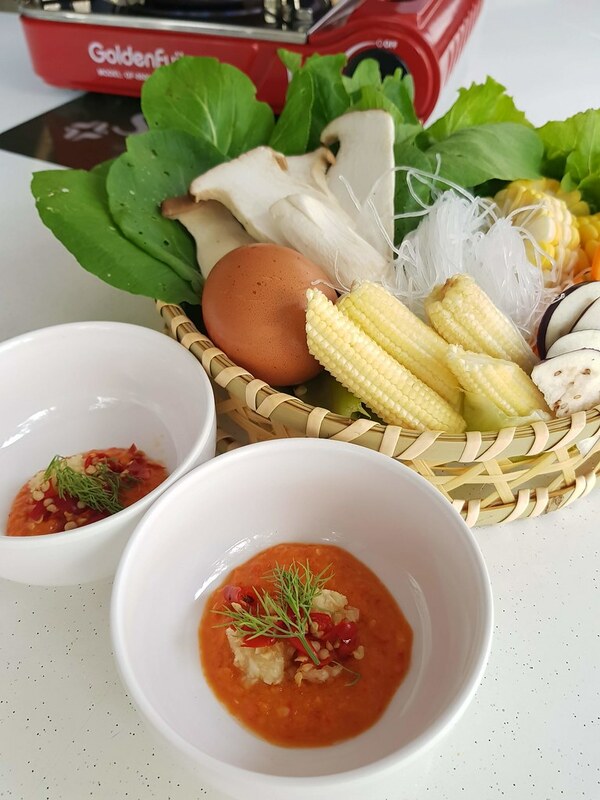 An initiative by Quan Fa Organic, this farm to table concept is an collaboration with our local and regional farmers, serving you only chilled meats, not frozen ones, organic vegetables, kampong eggs and homemade dipping sauces. You will see no store-bought processed foods on your table. 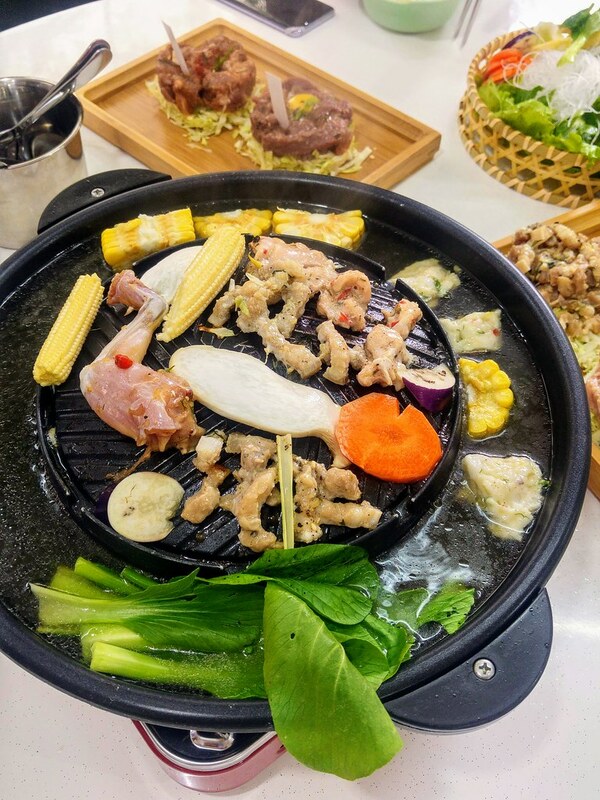 Our Set for 2 ($38) includes choice of 2 chilled marinated meat (small) from the selection of chicken, pork, beef and lamb, 2 prawns and frog legs, fish paste and a basket of seasonal vegetables. You can also choose to add on extra meat, vegetables and rice. 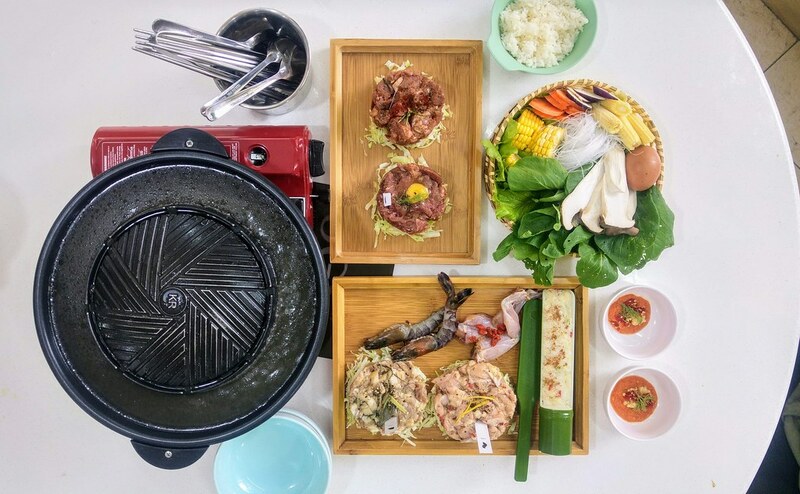 When our tray of meats was being served, for a moment, I felt I was having a Japanese hotpot in an upmarket restaurant - such exquisite plating for a Mookata in a coffeeshop! 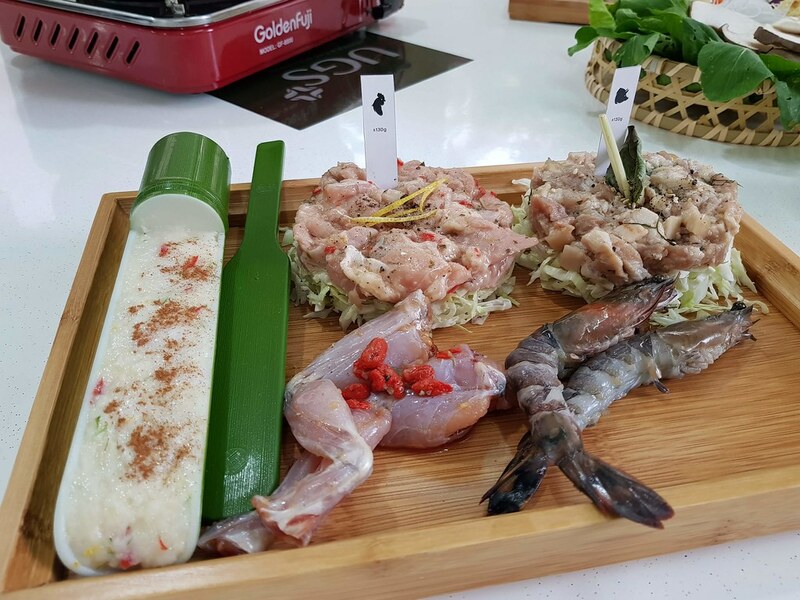 The Chicken Thigh is marinated with chili & tamarind, Pork Collar with basil and lemongrass and the Frog Legs are also marinated beforehand with Huadiao Jiu and wolfberries. 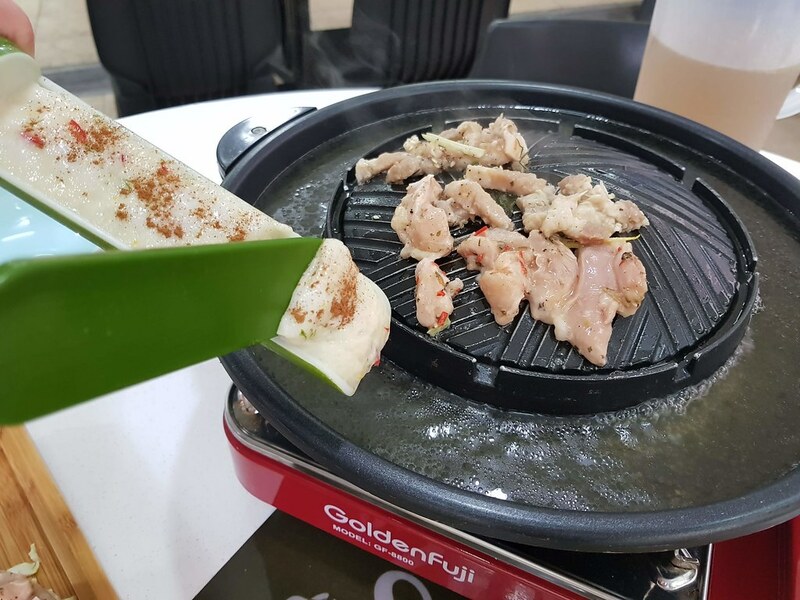 These chilled meats are supplied by Toh Thye San Farm, Fresh Fish Paste from Ha Li Fa (Bobo Fishball) and frog legs from Jurong Frog Farm. Commercial fish paste or fishballs to me are like mock meats, made with lots of flour and flavour masked by seasonings. However this Fish Paste is clean tasting using fresh fish flesh and natural seasoning from herbs and spices, including dills! 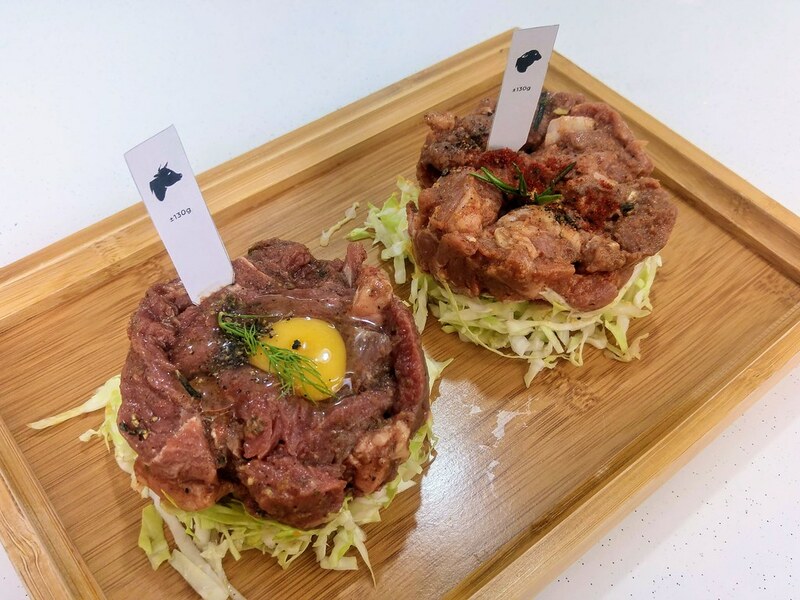 As for the chicken and pork, even though the meats were being cut a tad too small, they tasted pretty good in terms of flavour and texture. The shredded cabbage underneath the meats, they are salvaged from the unused exterior layer and are natural sweetener for your broth. So do throw them all into your broth once the meats are gone! One thing to highlight is that greasing your skillet is not your usual lard chunks, but a premium imported A2 milk Desi Ghee, which many may not know has medicinal properties as per ayurveda. Its high smoking point makes it even more apt for barbeque. The stars on the table, I feel are the broth and the basket of fresh greens. Both leafy and root vegetables simmered together with 2 whole freshly chicken daily, resulting in a very light but flavourful broth. The sweet corns were bursting with sweetness even after being in the boiling broth for a while. 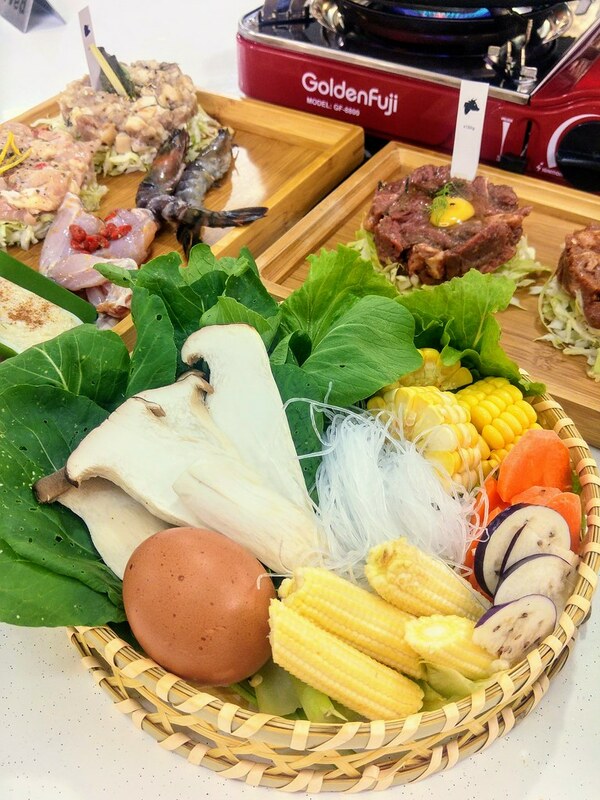 The egg is from Uncle William’s Lian Wah Hang Quail & Poultry Farm which is so fresh that you can have it raw too or as an egg dip like that of sukiyaki. Beware of this harmless looking bowl of homemade Suki sauce, it whets appetite really well. Concocted with a blend of fresh organic birdseye chilli, garlic, Thai miso paste and apple cider, it lifts the flavour of the meat with a bright acidity, along with just a bit of fiery kick. Heartier options for meat would be Smoky & Spicy Beef Striploin and Cumin & Rosemary Lamb (each $12 for 130g) which you can sear them to the degree of doneness desired. Though they are quality meats, I find them too overly seasoned, especially for the beef. 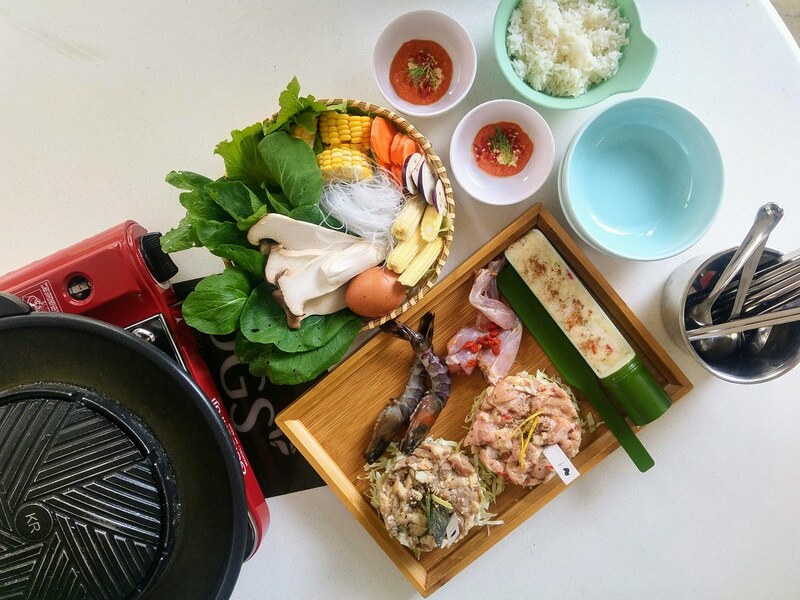 Farm to table experiences in Singapore are more often than not glorified and sit in the Lifestyle category. To find one in heartland is indeed rare and more so when Quan Fa Mookata is in the most western region! To be honest, the portions are too dainty for Mookata but what I appreciate is the kampong spirit embedded in the concept. This kampong spirit if not preserved and passed on in various ways, will soon be lost in our little island as more and more farms are being bulldozed for the name of developments.